Ever had a hair disaster? I sure have. A couple years back I visited my hairstylist to get my hair touched up. At the time I always dyed it dark brown and once the dye would wash out after colouring it, it would look black at first but then fade to a dark brown. Anyways, that one particular time I went to visit her, she didn’t ask me what I wanted, she just put black in my hair. Now the thing about black hair is that you can’t colour over it. I was basically stuck with black hair for about a year and a bit and when I would dye it the bottoms would be black and the roots would be a different colour. I hated my hair. In order to fix it I was told I had to get it colour corrected. Now, I’ve never had colour correction done but from what I understand, they basically just bleach out your hair and then colour over it. Not only is it extremely damaging to your hair but it’s also very expensive. I didn’t want to damage my hair, plus spend hundreds of dollars just to get the black out; I was trapped. Then, the Aveda Institute opened in my city, Winnipeg. 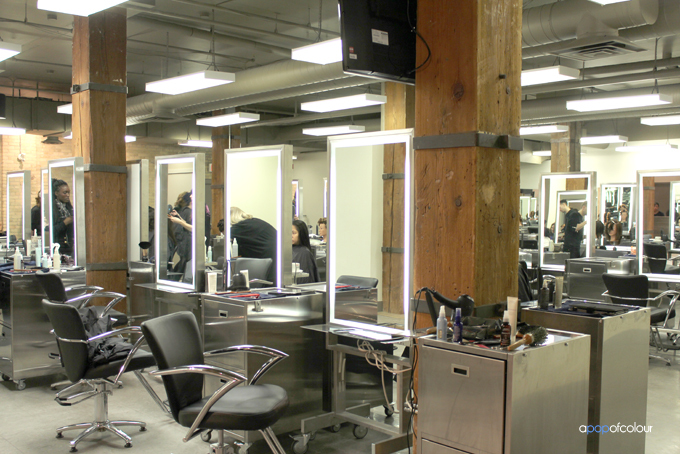 The Aveda Institute is a training institute for both hairdressers and those who want to enter the industry. We have a ton of different hair schools in Winnipeg, but Aveda is such a renowned worldwide brand, that to bring the institute to Winnipeg is a huge deal. The school is comprised of both the Institute program, which is a nine-month course learning the fundamentals of hairstyling, and the Academy program, which is for advanced learning. The Institute is for those who are just getting into hairstyling, whereas the Academy program is designed for those who already have their hairstyling license and want to get additional, advanced training. 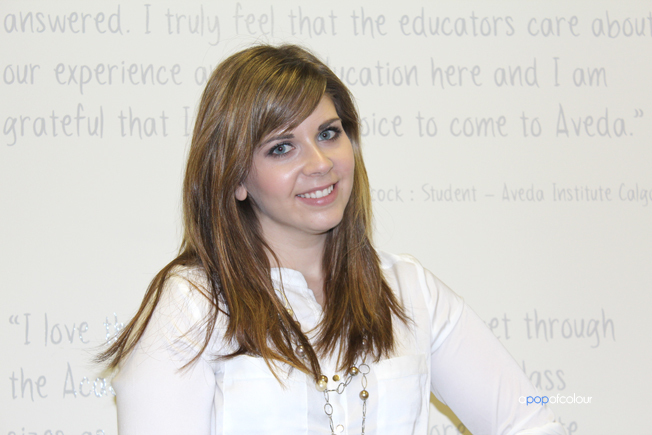 I visited the Aveda Institute Winnipeg in April 2012 for the first time and it was actually my first time going to a hair school. I was a bit skeptical going there because they are A) students, and B) I think we all have that image of I dunno, hair starting on fire, or getting a bad haircut, or something along those lines. Well, it turns out I had nothing to worry about because that initial experience of the institute was the best hair experience I have had in years. Because they are a hair school, you are there longer than a typical salon because the students have to consult with and clear everything they do with an educator. A haircut can take anywhere from an hour to two hours, whereas highlights can take up to four hours (at least from my experiences). When I went to the Institute back in April, not only did they lighten my hair, they also didn’t have to use a colour corrector. Back when I interviewed Dove celebrity-stylist Mark Townsend I told him about my hair and wanted to know his advice, he mentioned that colour correction is basically an easy way to up-charge clients. Instead of that costly, damaging procedure he mentioned to just get a bunch of highlights. Lisa, my stylist from when I visited the institute in April, first lightened the darkest areas of my hair and then put a ton of caramel highlights in my hair. I was left with beautiful hair and once and for all, I was done with the black. I could not be happier and have been going back to the institute ever since. In fact, I prefer it over an actual hair salon because I find it’s more controlled. Plus, these are students, so I find they are a lot more careful. So after that long story, this brings me to this post. 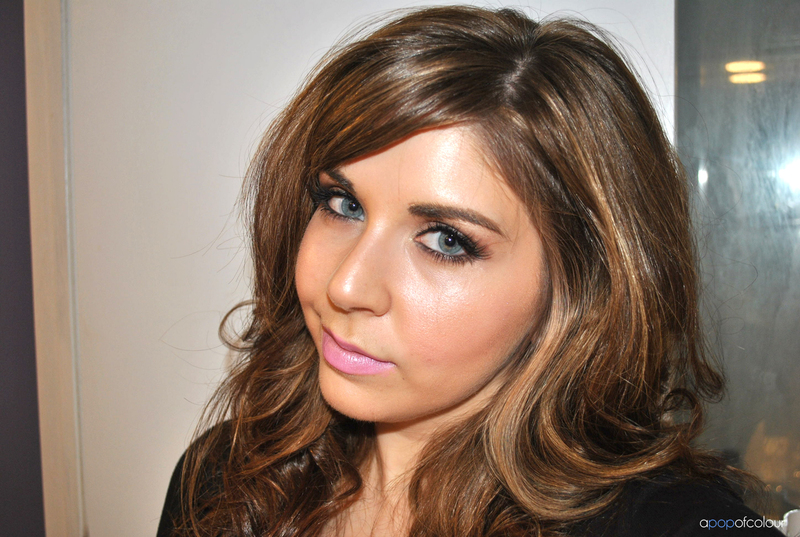 Last week the Aveda Institute Winnipeg invited me down for “Beauty School 101” on their method of highlighting. Since I visit the school already and am a huge supporter (I tell all my friends to go there, plus hello, $35 highlights?! ), I couldn’t wait to visit. Upon entering the institute, which is located at 80 Rorie Street in the Exchange District, I met with Francesca Rizzuto, who is a lead educator at the Aveda Institute Winnipeg. She mentioned that before they really do anything they teach the students about colour theory, so essentially the colour wheel. I know from past experiences at the Aveda Institute, whenever I would get highlights they never offered me a book of swatches. They had binders full of photos of models or celebrities, or they would offer up a photo on their iPad, and the colour you wanted would be selected from that. I always thought that was a bit odd as every salon I have gone to they have always had a binder of hair swatches to choose from. 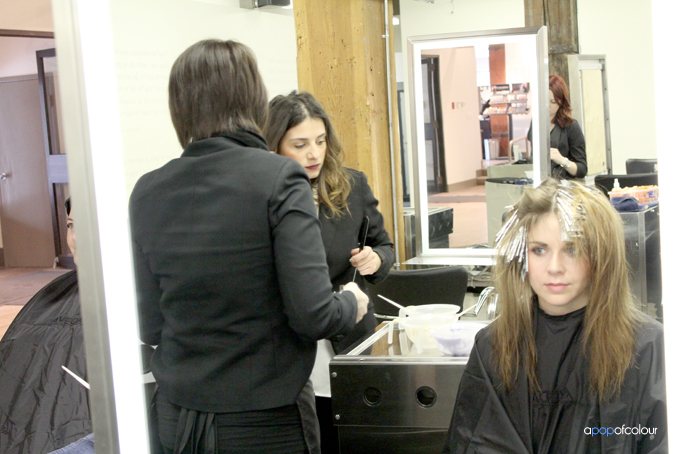 At Aveda, everything is customizable, so no two clients will get the same colour. In fact, the binder is part of the curriculum. 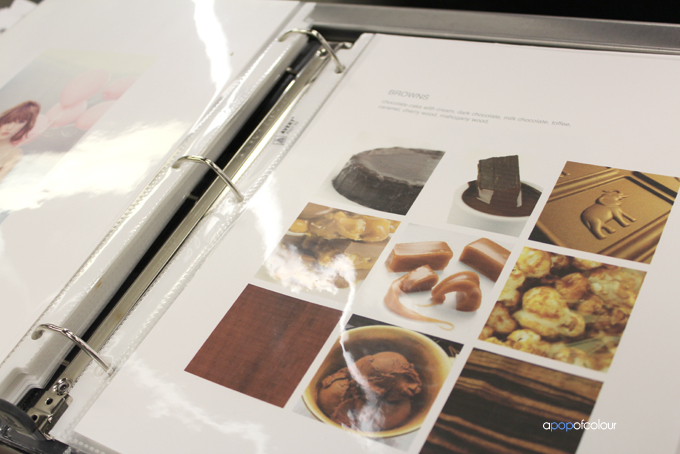 We flipped through one girl’s binder, also called a “look book”, and she had photos of models and different foods. Now the food thing was the most interesting aspect of the whole look book and something that is so obvious but it’s never dawned on me. When you ask for a colour, most of the time you are asking for shades that are named after foods. For example, chocolate brown, caramel, wine, plum, etc., however, everyone has different perceptions of what those shades look like. For example, whenever I have asked for chocolate brown, and the stylist showed me what swatch was called “chocolate brown” I have always thought that the swatch was way darker than it should be. In the particular look book I saw, there were numerous different chocolates pictured so the client could pick which one they envision would be chocolate brown. The consultation is where the difference lays between a salon and the institute. 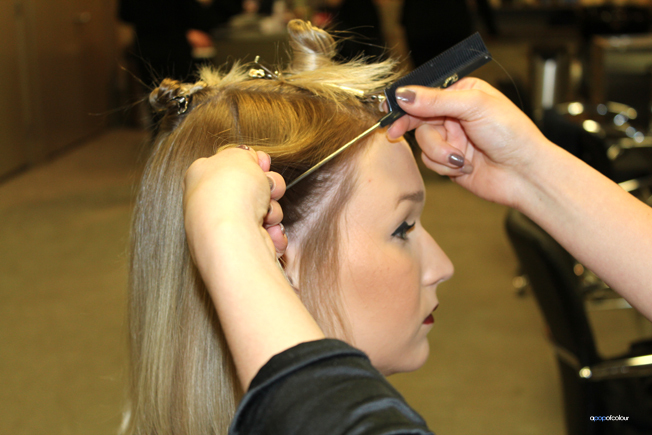 As for the actual highlighting, students at the institute learn about density; how many foils you put in a client’s hair and how close and far apart to put them together. This is usually done on a mannequin prior to an actual client. They learn seven to eight basic placements and move them around. In the nine-month Institute course, the basics are essentially the same, whereas in the Academy course, they move the placements around to suit each client. They also learn basic sectioning and vision crafting, so what colour looks good on their client and how many foils would be best. Francesca pulled a student model to show us how they section the hair and apply the highlights. First things first, the hair is sectioned out (they are super strict about sectioning) so the stylist knows which panel to put the colour on. They then take the foil, which should be the length of the section of hair plus an inch on either side, which is folded over once the foils are in your hair. Francesca started on the side of the head and then worked her way up. The first foil was on a diagonal angle and then as she went up, the foils levelled out. This is because when you pull your hair into a ponytail the colour blends better. She also showed us two ways of placing the foils. One way is to place the foil right at the root as it’s faster and prevents bleeding, it’s also harder. An advanced way is to fold the top part of the foil over the comb and then place it at the roots. Once the demo was over, it was my turn in the chair. I had a consultation with my stylist Sarah, who graduates at the end of January 2013, and we decided to still keep it light (I’ve been dark for so long so I’m not quite done with the blond yet). She showed me a photo of Jennifer Aniston on her iPad and since I’m not that picky about colour, I said let’s do it. She said that she would be using highlights and lowlights; two shades of blond and a colour similar to my natural colour. They would be focusing the colour on the top, front, and sides and maintaining the natural colour on the bottom. They would be using finer highlights so the colour all blends together. Both Sarah and Francesca got to foiling up my hair, and since Aveda places a strong emphasis on keeping hair as healthy as possible, they didn’t put colour on the ends, only on the regrowth, so the tips of my hair were sticking out of the foils. They also do the front of the head first because that way they can work in a more organized way. Also, people usually want the front of their face to be the lightest. Another thing that I thought was neat to learn was that the colour station is placed behind the client so it’s more ergonomical for the stylist to reach the colour if it’s right beside them, rather than on their work stations so they aren’t turning their bodies constantly. I also want to note that the you get the full Aveda experience at the institute. I had three cups of the fab tea, I got a hand massage, and Sarah did a head massage once she rinsed the colour out. Once the colour was rinsed out, Sarah showed me and applied a variety of Aveda products to my hair. 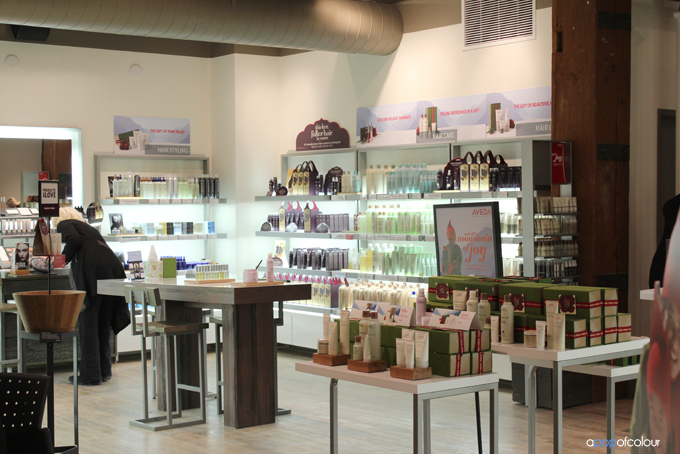 The Aveda Institute Winnipeg also houses Winnipeg’s only Aveda retail store. I have used Aveda products in the past, most of which were the shampoos and conditioners, which have never impressed me. I’m not sure if I just have been using the wrong product lines for my hair, but I found Aveda shampoos and conditioners have never done anything for my hair. Prior to blow drying, she applied Damage Remedy Daily Hair Repair (C$30), which is a lightweight heat protectant and leave-in conditioner, which she concentrated on the mid-to-end shafts of my hair. After that, she put applied four pumps of Phomollient (C$20.50), a styling foam which adds weightless volume and shine. Next she used Volumizing Tonic (C$21), which is a root lifter that you apply prior to blowdrying. The rose scented product was sprayed in three to four sections down my head. Next, she pulled out the blowdryer and did my fringe first to get my cowlick under control. Then she focused the hair dryer to my roots to add volume. Once my hair was dry she applied one pump of the Light Element Smoothing Fluid (C$34) in the mid-shaft to the ends of my hair to control flyaways. Lastly, she used Hair Control (C$34), which is a lightweight hairspray designed to tame flyaways and static. I actually used this hairspray when I got to the institute on my shirt as it was sticking to me like glue. After flat-ironing my hair she took me over to the retail side and just touched up my lips by applying Aveda’s Hydrating Lipglaze in Himalayan Snow which added some shine and megawatt power to YSL’s Rouge Volupte #7, which I was wearing. My hair isn’t a drastic change from what it was prior, in fact most people didn’t even notice that I got it done. I love it though and it’s exactly what I wanted. The end result is very subtle and Sarah did a great job on it, better than any licensed stylists I have been to prior to visiting the Aveda Institute. 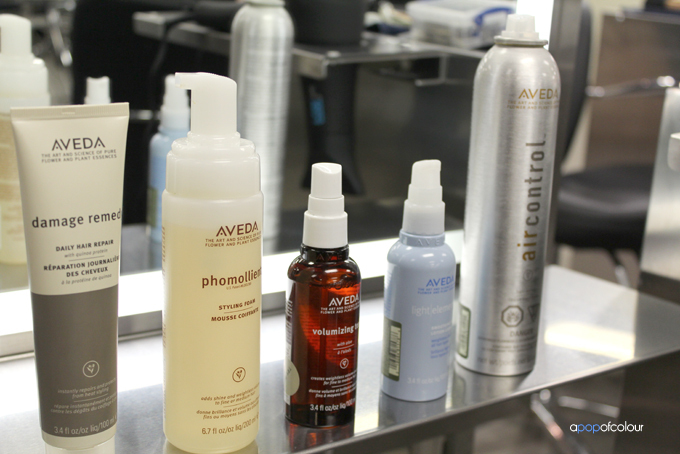 Aveda has institutes all across Canada, as well as in the United States. For a location near you, visit them online. I did receive complimentary highlights this last time I went, however, it did not affect my experience there. I have been going to the Aveda Institute ever since April 2012 and have had a wonderful experience every time I have gone. You can ask any of my friends and they will all tell you that I highly recommend the salon as it’s not only a hair school, but a fabulous place to get your hair done, for a reasonable price (haircuts are $15 for Institute students, $30 for Academy students). In fact, if you visit the Academy salon, those are already licensed stylists who work in the industry, and you get their services for less than you would pay at their actual salons. There are those stigmas against hair schools but Aveda’s environment is very controlled and I have never had any bad experiences with the institute (unlike that one hairstylist I visited a couple years ago, who was licensed). If you have an Aveda Institute near you, I would highly recommend giving them a try; it may take a little longer than a traditional salon, but it’s so worth it. One more thing, if you always wanted to become a hairstylist, now could be your chance! The 2013 Born to Style Hair School Scholarship contest has just kicked off and is now accepting submissions from future rock star hairstylists across Canada. If you or someone you know wants to kick-start an exciting career, then this could be your big break. 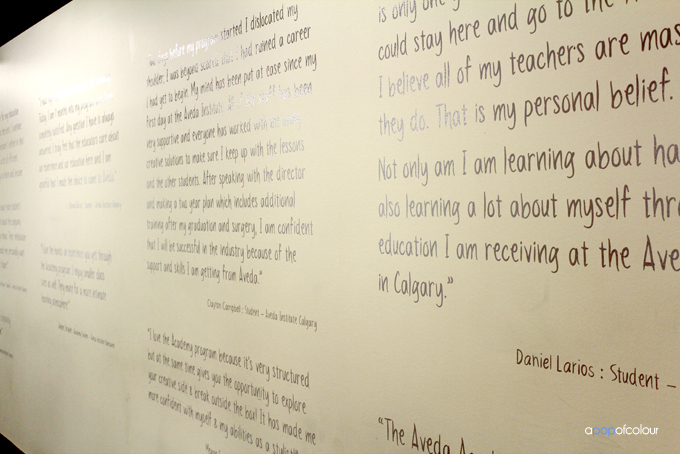 Four full scholarships, one each to the Aveda Institute in Toronto, Winnipeg, Calgary and Vancouver are up for grabs. Great cash prizes, and the chance to secure a spot in the finale are available for those who get in the game and win votes early. Visit http://www.borntostyle.ca to enter. 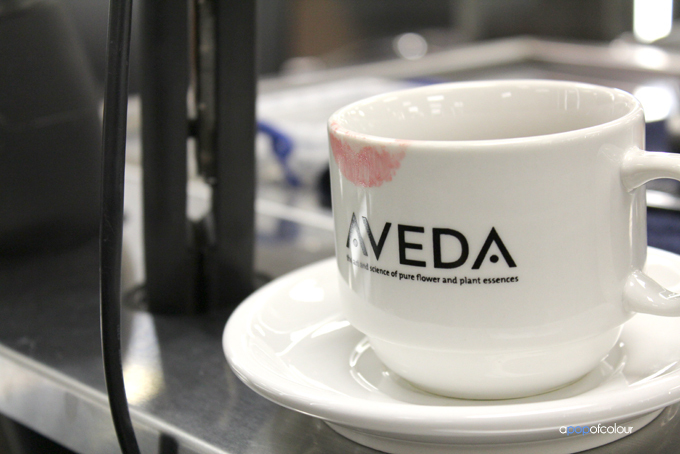 Have you visited an Aveda Institute? What were your thoughts? Please note, I did receive complimentary services in exchange for a blog post. As always, all opinions are my honest own. Thanks for taking the time to write this post. I’ll definitely consider them when I want to grow out my black!